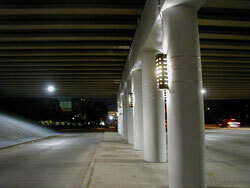 Houston lighting upgrades are a specialty of the experienced professionals at Highlights Electrical. 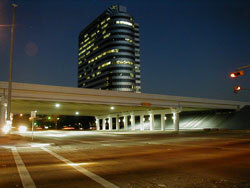 Please call our professional lighting staff today at 713-266-6464 to discuss your business needs. The experienced, Highlights Electrical Staff produces in-house lighting designs and upgrades including AutoCAD drawings and lighting output projections for new and existing facilities in the Greater Houston area and the United States of America. Highlights Electrical is committed to providing our customers with the most advanced technology in light fixtures and lamps to enhance security and provide maximum energy efficiency for helping Houston businesses to reduce energy costs. Let us help your business with cost-effective solutions for all of your lighting design, lighting upgrade, light fixture and lamp requirements today. Our excellent reputation for skillful design is based upon many years of putting our customer’s interests first in everything we do! 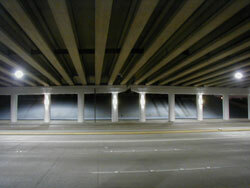 The overpass project shown in the pictures on this page is in the Westchase District. For more examples of the many lighting design and lighting upgrade work performed by Highlights Electrical through the years, please contact us. We would be happy to provide you with any commercial lighting upgrade or design information you need! Custom lighting fixtures were utilized as part of our design in this Westchase District overpass lighting project to achieve the desired results for our clientele. Please call Highlights Electrical today at 713-266-6464 to discuss Houston lighting upgrades for your current project or facility. Complete satisfaction is our top priority for every job we perform.